A new Android Trojan is capable of recording phone conversations, according to a CA security researcher. The trojan is triggered when the Android device places or receives a phone call. It saves the audio file and related information to the phone's microSD card, and includes a configuration file with information on a remote server and settings used by the trojan. According to the post, the trojan presents itself as an "Android System Message" that requires users to press an "Install" button for it to insert itself in the phone. 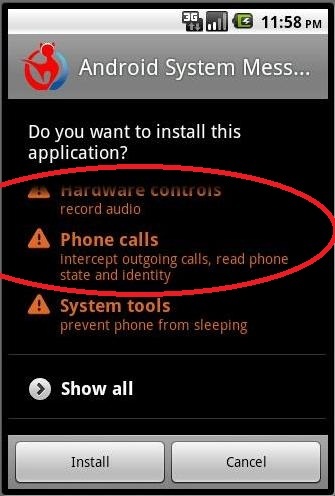 Once installed, the trojan records all incoming and outgoing calls to a directory on the microSD card as .amr files, as well as information about the call, including its duration, in a text file.